I love the idea of combining two different desserts to make a different tasty creation. For example, combining chocolate sandwich cookies and white cupcakes with chocolate frosting…yum! I made these for our going away party and they were quickly gobbled up! 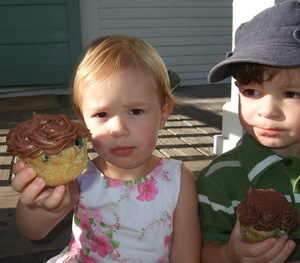 My friend Karen sent me this photo of her niece and nephew (Lucy and Evan) very seriously enjoying them. A couple of weeks ago, I was browsing magazines in the airport when I came across a special party food issue of Sunset. 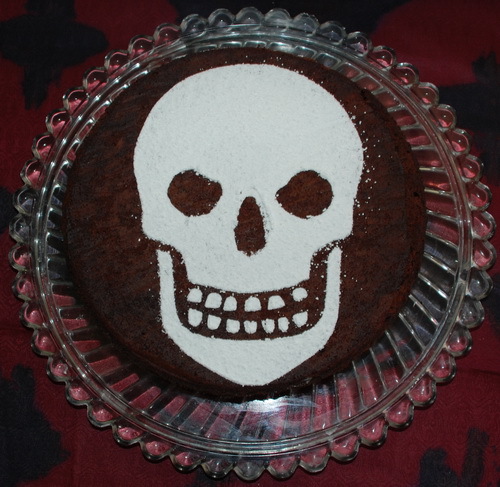 Flipping through it, not much stood out to me besides this amazing skull chili chocolate cake. Yum! I refused to spend $10 on the magazine for one recipe, so I diligently wrote it down on a small scrap of paper. When I got home and actually made the recipe, I was a little concerned that maybe I had left out at ingredient or wrote down the amounts wrong. But it turned out splendidly! Despite all the chilis, this cake actually isn’t that spicy. It has a subtle kick that hits you about a minute after you start eating it. A subtle, good kick. It is soooo chocolately and dense which makes the whipped cream a perfect companion. I had a hard time finding a skull stencil, so with the help of Melissa, I made my own. We used an outline from the internet, adjusted it in photoshop, transferred it to cardstock and cut it out with an exacto knife. I know that seems like a lot of work, but I’m holding onto that stencil for future cakes! Okay, I am well aware that Easter is far away (and so is Spring for that matter). But Melissa brought over these awesome sprinkles that just had to be sprinkled! 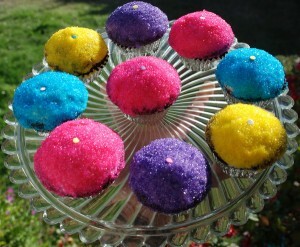 Once atop the cupcakes, I couldn’t help but think: Easter eggs! Of course, these cupcakes could be made according to the recipe and decorated differently to more appropriately fit the season… like perhaps orange and black or some leafy color. It sure was nice though to have some Spring cheer after the first rain of the season! My mom and my sister came to visit this weekend and we had a lovely time eating, relaxing, chatting, and eating some more! I wanted to bake something with them, so we browsed through recipes until we hit on one that sounded really yummy: Mocha Mud Slide from the Millennium Cookbook. 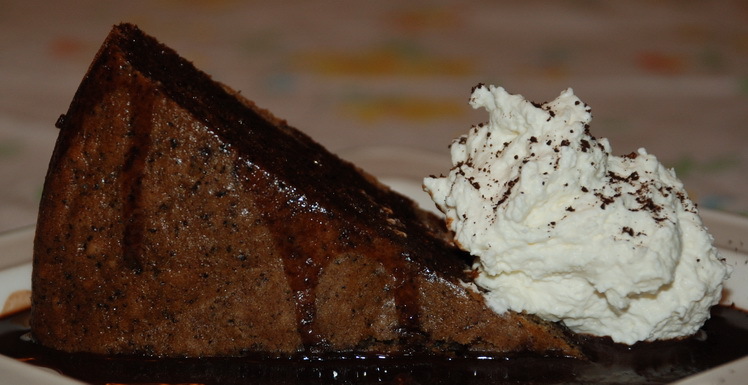 Espresso + chocolate = good, but espresso sponge cake drenched in rich chocolate espresso sauce + whipped cream = Heavenly! Mary was a lovely sous chef and my mom took a different type of supportive role, entertaining us with her commentary. We modified the recipe only slightly to make it more espresso-y. The cake took almost no time at all to prepare and the sauce was quite easy as well… quite unusual for a Millennium recipe! Since I don’t have much caffeine these days, the espresso was enough to keep me up later than usual with creative energy. Mary didn’t seem to have any problem falling asleep shortly after dessert! 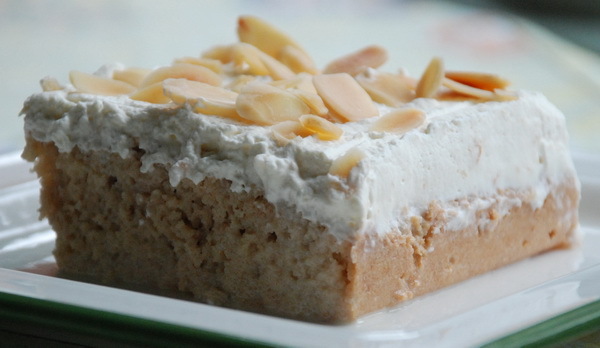 So, even though this is a vegan recipe, I must confess that I cheated a little bit. Homemade whipped cream sounded too good to pass up! However, if you want to make the whole dessert vegan, buy or make vegan whipped cream or substitute with vegan ice cream or sorbet- vanilla, chocolate or espresso would be great! Also, try any leftover sauce poured on vanilla ice cream… it is delicious! I’ve been staring at a bunch of overripe bananas in the fruitbowl on my kitchen counter for about a week thinking… I should make something with those… and banana bread seemed like the obvious choice. But it also sounded a little bit boring to me at the time. 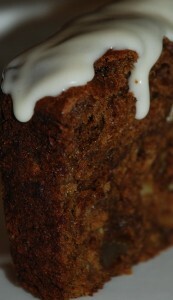 So, I dug up a recipe for gingerbread from one of Sarah Kramer’s books and added bananas to it. I put pieces of candied ginger in mine as the recipe had called for, but I must admit that I did not at all like their texture once cooked. They went from chewy gummy-like to slimy crunchy-like. Yuck! So, I’ve left them out of the recipe below, but feel free to add 1/2 cup of the chopped suckers and see for yourself. We haven’t had cable television for a long time. And I must admit that the only thing I miss about it is the Food Network! So, while staying at his mother’s house, John so kindly recorded a bunch of Good Eats episodes on Tivo. I watched one after the next, trying to absorb as many tricks and techniques as possible! One of the episodes was on milk, which is an ingredient that I usually find to be quite boring. But, of course Alton Brown made it interesting! He made this amazing Mexican cake which he poured milk over and let it absorb overnight before frosting it with whipped cream. Something about this process made my mouth water! After my interpretive post on the Carmelite Monastery, Diana requested that I create something in honor of Taqueria Los Gallos. Well, here it is! It may not represent the rooster well, but it is damn tasty after spicy tacos! While making this cake, I kept getting the feeling that I was doing something wrong. So, if that happens to you, don’t fret and just trust the process! It feels awfully weird to make a dense and short cake, then poke holes in it and pour milk over it… but that is the beauty in this recipe- it is weird and it works. Just remember it is milk-cake, so it is supposed to be a bit of a mess! 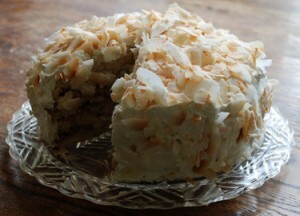 Also, this cake has to sit overnight, so make sure to make it a day ahead of your big cake eating bonanza! A few weeks ago, as John and Mike rode their bikes from Santa Cruz to Monterey, Alison and I adventured off for a lovely stroll in the Point Lobos State Reserve in Carmel. We spotted an interesting looking church in the distance and attempted to walk there, but were stopped by the chain link park fence. On our drive from Carmel to Monterey, we decided to stop and take a closer look at this old structure nestled amongst the hills and trees overlooking the Monterey Bay. The Order of the Brothers of Our Lady of Mount Carmel was founded in the 12th century on Mount Carmel, Israel. 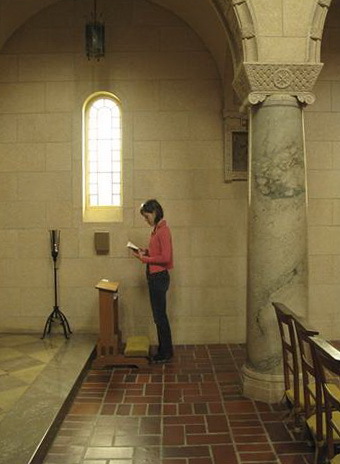 The Carmelite Monastery in Carmel, California was built in 1931 and is still home to cloistered nuns. It is very simple and elegant, with quaint garden walking paths, abalone shell sculptures and a small chapel. We were excited about the rows of individual sitting and prayer chairs in lieu of pews in the chapel. The colors were very soothing- lots of whites and creams and tans and browns with touches of green and yellow in the simple stained glass windows. As we were leaving, Alison and I brainstormed what kind of dessert would best represent the Carmelite Monastery. 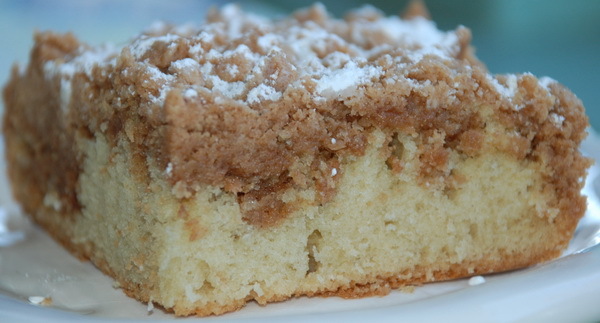 At first we thought of something dense and chewy, but settled on something lighter but a little rustic. We new it had to be super carmely, and don’t worry, this is! 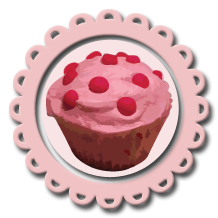 You are currently browsing the archives for the Cakes category.